This zombie hardboiled private investigator works for booze. “I woke up dead this morning,” begins Braineater Jones by Stephen Kozeniewski. Jones is a zombie, yes, but he’s an intelligent zombie. Well, maybe more like he’s a street smart zombie who is still able to ask those important questions like “who am I?” and “why am I dead?” as well as “who killed me?” Set in the 1930’s, Braineater Jones evokes fond memories of the hardboiled sensibility of Sam Spade and the Nazi complications of Indiana Jones. The story line is simple. Man is killed, returns to life as zombie, retains the ability to think, yet remembers nothing about his past. Instead he finds himself in a world where zombies live in an uneasy truce with the breathers, doing the dirty work and keeping their brain-eating under control. Jones gets a crash course in zombie-breather politics as he maneuvers his way around the Mat, the zombie section of town. And there are politics. This isn’t a zombie world of shuffling, moaning, people-eating decomposing corpses. These zombies hold jobs (but not very good ones), mourn the lives they left behind, and drink copious amounts of alcohol to keep themselves from turning into brain-eating monsters. Jones’ benefactor, Lazar, is a mysterious, maybe-zombie who lives with the breathers. Jones’ sidekick is a wise-cracking zombie head by the name of Alcide. The boss of this underworld is an aborted fetus who lives in a jar of Old Crow whiskey and dreams of a day he can have a robotic body courtesy of the Nazis. Yeah, even zombies have dreams in this novel. This book has it all. A great pace, a fantastic story line, cool zombies, and a zombie world that is unlike any other I have entered. Braineater Jones is a refreshing find in a genre that too often follows a predictable pattern heavy on blood and gore. 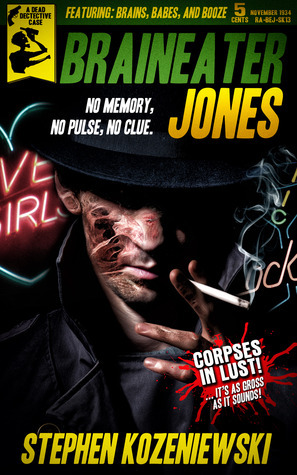 As of 1/16/14, Braineater Jones is available on Amazon for 99 cents, an absolute bargain. Pick up a copy today and you’ll join me in asking the author for a sequel.